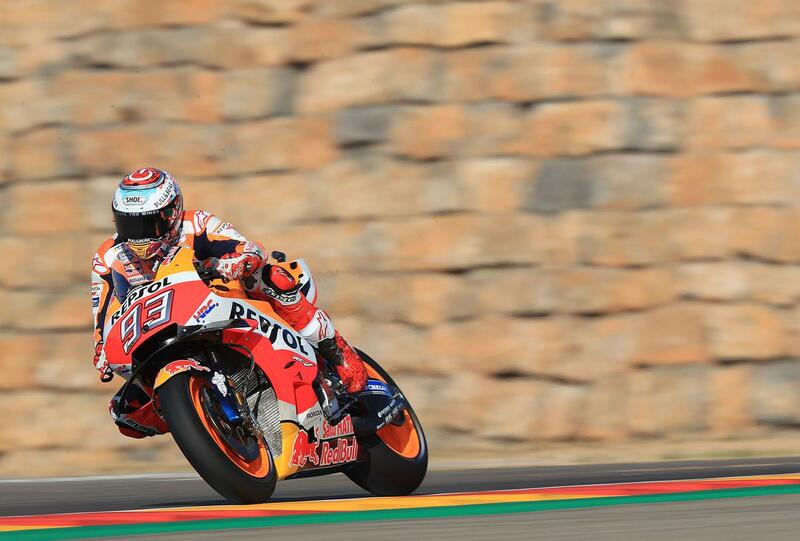 Marc Marquez has moved one step closer to retaining his MotoGP world championship by taking an impressive home victory at the Aragon Grand Prix. Looking strong all weekend, he was nonetheless forced to work hard by Andrea Dovizioso and Andrea Iannone. However, it was a less successful race for pole man Jorge Lorenzo, who crashed out in the opening corner. Lorenzo was imperious on Saturday but it was Marquez who got a great launch from third and dived up the inside to grab the holeshot on Sunday, before both he and Lorenzo headed wide. That's when Lorenzo crashed, suffering a dislocated toe in the process. Opinions on the incident differed between the two men but it did leave Dovizioso in the driving seat as he capitalised on the scruffy start for his two biggest rivals, taking the lead as Marquez slotted back into second. With Lorenzo blaming Marquez for his highside in last weekend’s Aragon Grand Prix, we ask: who was to blame? Behind the drama, Iannone and Alex Rins bolted out the blocks to move forward into the fight, with Dani Pedrosa and Aprilia Racing Team Gresini’s Aleix Espargaro hot on their heels. Cal Crutchlow was also in that tousle in the early stages, but the Brit crashed out five laps in. So began the battle for Aragon. Rins was looking menacing behind Marquez, feinting numerous overtaking attempts into the first corner as both Suzukis kept tabs on the leading duo and by lap 11, Dovi, Marquez, Rins and Iannone had edged out two-second gap to Pedrosa and Espargaro. The stage was set. A number of laps later Marquez pounced again at T12 and set off another flurry of duelling. This time, however, Iannone was able to get involved and as Dovizioso took the inside at turn 15, Iannone took the outside and it made for a stunning sight as Marquez was briefly swamped by both. The Ducati and Honda were back in the lead soon after, but Marquez was about to play his ace. The race-defining move finally came from the number 93 at turn five, and the reigning World Champion held firm until the chequered flag to take a third straight win in Aragon, equalling Mike Hailwood’s win tally of 41 for Honda. Dovi was forced to settle for second but equalled Casey Stoner’s Grand Prix podium count, with Iannone earning his third podium of the year and Suzuki's first at Motorland Aragon. The rostrum was also enough to mean the Hamamatsu factory will now lose concessions. Fourth was local hero Rins as he took a second consecutive fourth, with Pedrosa securing his first top five since the Catalan GP at his penultimate home Grand Prix. Espargaro excelled in sixth to pick up the Aprilia’s best result of the season and their best result so far, with the Spaniard beating Danilo Petrucci to top Independent rider as the Italian came home seventh. Valentino Rossi, meanwhile, was another headline act as the Doctor sliced through the field from P17 on the grid to take eighth, ahead of Jack Miller after the two battled in the latter stages. Rossi's teammate Maverick Viñales rounded out the top ten. 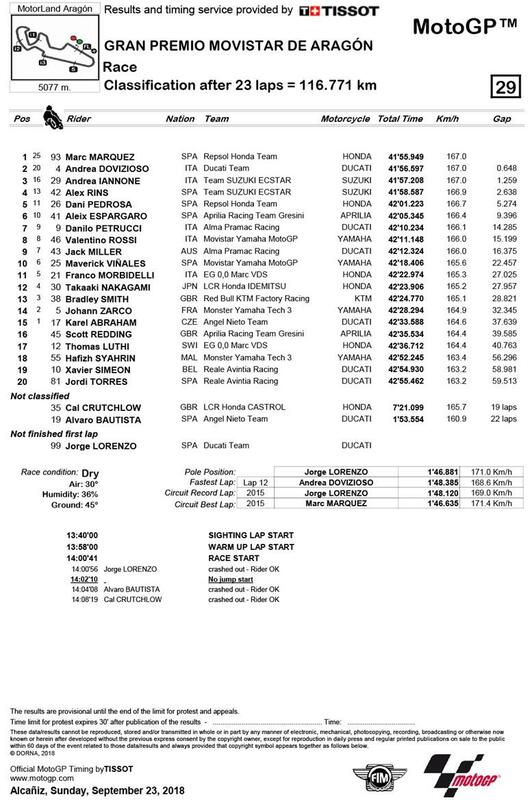 Franco Morbidelli won the battle of the rookies in 11th, with Takaaki Nakagami 12th. Bradley Smith had a solid race to take 13th, ahead of a tough day for Johann Zarco in 14th and a points finish for Karel Abraham in 15th.